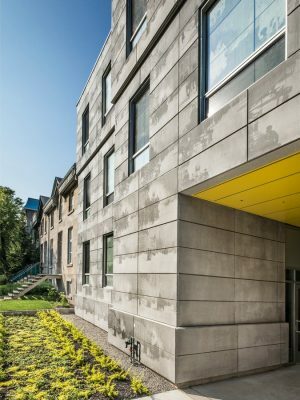 A small vacant lot located at the epicenter of Montreal student life, just north of the McGill University’s Milton gates, was the basis of the latest design by KANVA. The site endured a fire in the early 20th century, which flattened the existing 19th century historic stone house; this tragedy represents only one of many narrative layers embedded in the land. 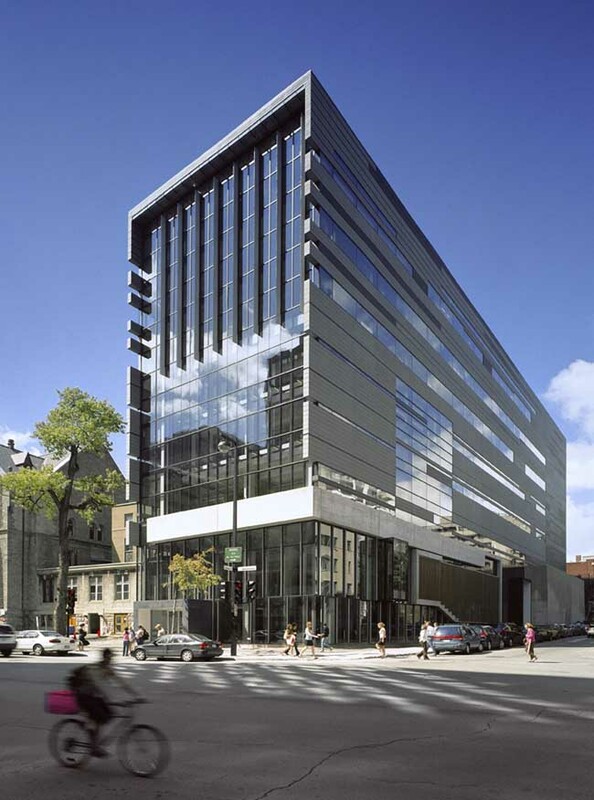 The historical context of the site became the primary inspiration for the urban renewal project, which lead to the exploration of an innovative concrete fabrication technique; photoengraved concrete panels that enabled the building to tell a story. 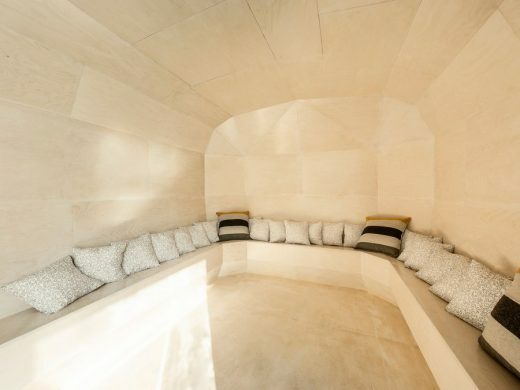 The project encapsulates an architecture ‘parlante’; an architecture that heightens the intellectual and perceptual experience of its inhabitants by stimulating active looking. 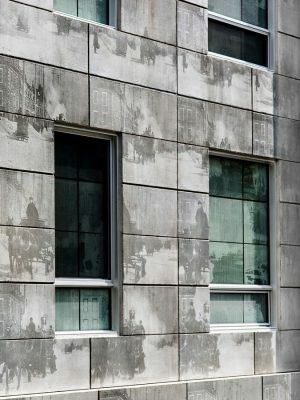 The film sequence photoengraved into the concrete façade is extracted from the sequence of stills from the film: Montreal Fire Department on Runners (Edison, 1901). The film was carefully chosen for both its historical and contextual relevance: referencing the fire that vacated the site and highlighting the prolific inventor Thomas Edison, an important contributor to the development of ‘tableaux mouvants’ and motion pictures. 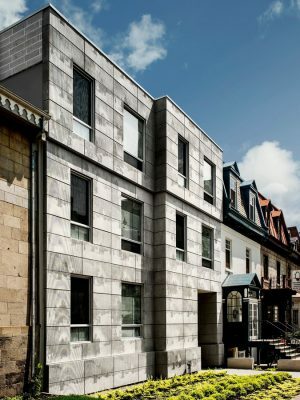 Materiality constraints arose from the outset of the project due to the fact that the site is positioned in a Montreal heritage zone; the palette was limited to masonry. The design team approached this predicament as more of an opportunity to challenge conventions and to test the limits of concrete. The process of photoengraving concrete was selected for its sensitive properties; it does not overwhelm the viewer but rather invites the user to re-imagine a story, as they move past or through the building and the film stills progressively move in and out of focus. The refined technique of photoengraving is an intricate tool facilitating a playful and adaptable narrative, on an otherwise brutal and barren material. Specifically, the process of photoengraving translates an image into a positive/negative representation, which is then converted into a series of vertical striations that form the image. Playing on light and shadow, each film still, and by extension, the sequence in the photoengraving technique is perceived in an ever changing, dynamic manner as the sun’s oblique angles accentuate or the clouds soften the visual perception of the vertical ribs that form the image. 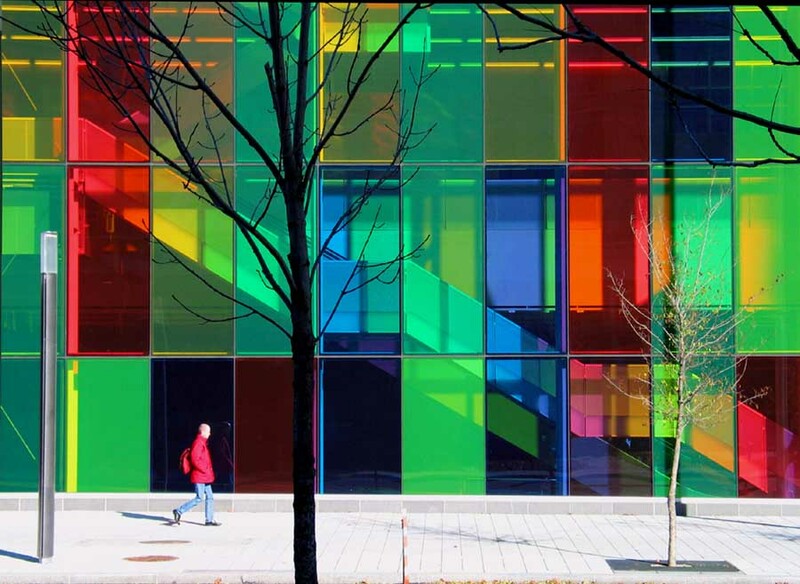 The panes of glass on the front facade are also screen-printed with complementary images, helping to achieve the desired sequential effect. 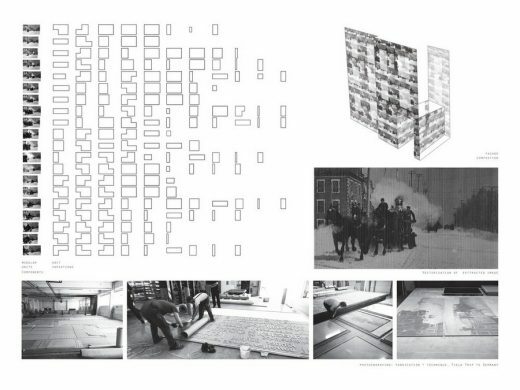 As students occupy or visitors pass by the site, their proximity and angle relative to the façade, in addition to the speed at which move, transform the way the sequence is viewed. 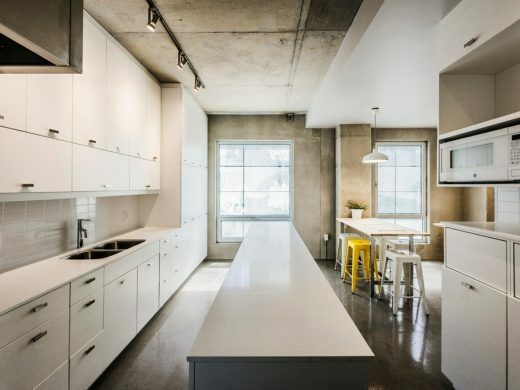 The choice of program for the building, a student residence, came naturally due to the proximity of the University campus. The two defining public and private volumes host internally their respective private and public functions. 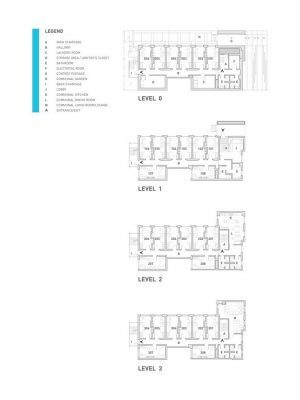 The intimate residence houses thirty (30) individual rooms, communal living spaces such as kitchen, lounge, living room etc. 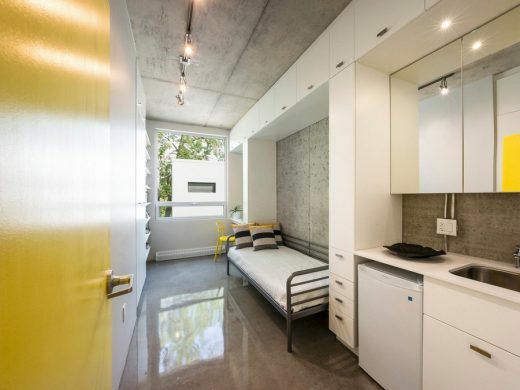 Each student room is designed as an optimal module, outfitted with floor to ceiling built-in storage that frames the bed along one wall, and allocates an alcove opposite to slide in a desk. 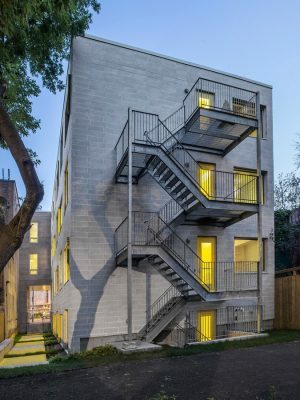 All private rooms give onto the quiet communal garden, which wraps the entire footprint of the building, providing both recreation and security for the users. 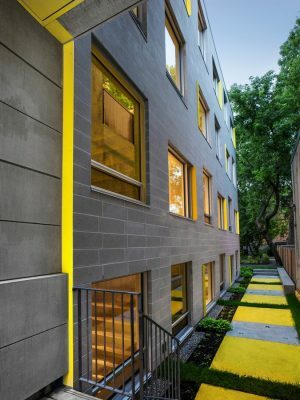 The side façade and garden abides by the same conceptual cinematic strategies; the yellow markers are a graphic way of marking individual living modules. 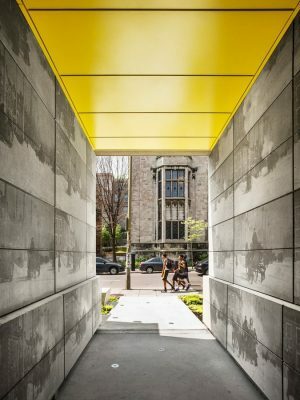 The primary entrance is through a porte-cochère, a contemporary tribute to Montreal’s traditional method of building a protected passage for horse carriages, which offers an intimate approach to the building. 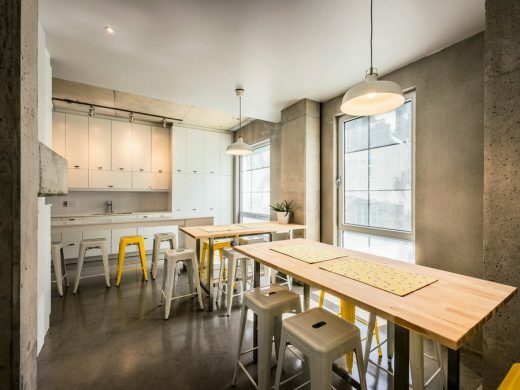 The common spaces are positioned within the public domain of the building giving onto busy University Street and are designed to optimize flexibility and incite appropriation by the student residents. 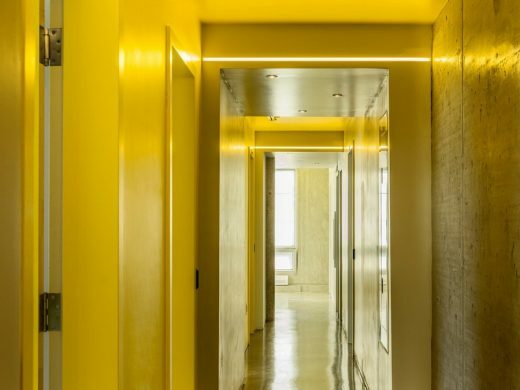 Edison Residence creates an animated architecture by using new technology in a socially engaging way. 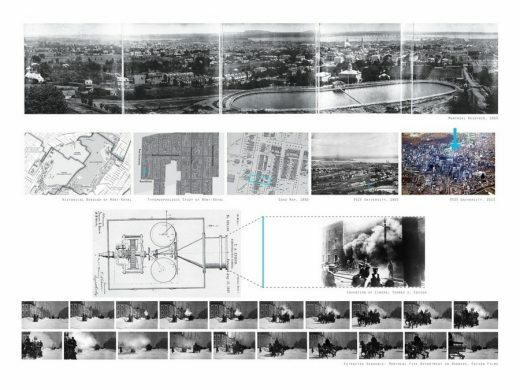 It calls for participation and reflection by the viewer as he or she contemplates the transformation and evolution of the site, and by extension the City. Most importantly, the Edison residence will be an inspiring living space for a student as they broaden their horizons.